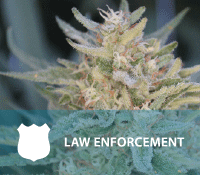 Law enforcement is the primary entity designated with the compliance and enforcement aspects of the Medical Cannabis Registry Program. Cannabis is a Schedule 1 Drug, is illegal at the federal level, and all Hawaii program participants are required to maintain “strict compliance” with part IX, chapter 329 to be afforded protection as a registered program participant and to assert the medical use of cannabis as an affirmative defense to any prosecution involving cannabis under part IX, chapter 329 or chapter 712. Designated Officers are the only individuals that can verify if an individual or grow site is registered in the program and take action in the event that either the individual or the grow site is not registered. The Department of Public Safety’s Narcotic Enforcement Division and Sheriff’s Division as well as all County Police Departments have Designated Officers that may access a secure 24/7 online SUBJECT verification system to verify that PATIENTS OR CAREGIVERS are registered in the DOH Medical Cannabis Registry Program. It is important to note, Honolulu Police Department’s current practice is to verify whether a firearm permit applicant is a medical cannabis registry participant and will deny firearm permits to individuals who are registered in this program. Many areas of community concern are not specifically addressed in the law. The smell of cannabis smoke from a neighbor’s home (single family, condo, etc.) – all “smoke free” laws (see §328J) also apply to medical cannabis and Registry staff typically refer complainants to their Board of Directors or property managers (for condos/apartments) or to speak directly to their neighbors in this regard. The smell of cannabis plants growing in a neighbor’s yard – there is currently no legal guidance in this regard and Registry staff typically recommend that the complainant file a report with local law enforcement to verify if the site is appropriately registered. Please see §329-D for specific offenses related to dispensaries. The Registry program requires that all registered medical cannabis participants 1) carry their 329 Card and their valid ID any time they are in possession of medical cannabis and 2) tag their plants in accordance with the stated Tagging Guidelines. 2019 Update: 329 cards will be issued electronically for in-state and out-of-state patients and they will be able to either print a paper copy or save a copy to their smartphone. We require all patients/caregivers strictly comply with Hawaii state laws and rules. Not having wifi/ data to access their card online or on their phone is not a valid excuse. 329 cards should be readily accessible upon request. Designated law enforcement officers have 24/7 access to the DOH system to verify if an individual holds a VALID 329 Registration Card – applicable to all in question. 3. Valid government ID number that was used by the program participant to register. The search result will indicate if the information entered is tied to a Patient or Caregiver, if the individual is Valid or Invalid, and if Invalid, an expiration or transaction date will be provided. If the information entered is NOT in the system, the result will be NO MATCH found. Although local law enforcement has direct 24/7 subject verification access as noted above, designated officers must FAX requests for GROW SITE verification to DOH at (808) 733-2178. Responses to GROW SITE verification will be provided from 9 AM – 4 PM, M – F, excluding State Holidays. Designated Officers can conduct 24/7 subject verification here.